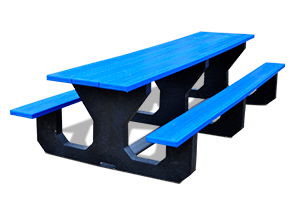 Perfect for toddlers and preschoolers this recycled plastic youth picnic table designed ideally for their scale. The table offers a sturdy table ready for activities with no need to worry about splinters or to cry over spilt milk. Recycled plastic will not splinter, rot or corrode and washes clean with simple soap and water. Great for both indoor and outdoor use the plastic is virtually maintenance free and will not crack, peel or fade. Available in the colors as shown.